Back to wave studies after Sunday's sunset. This really is the calm before the storm. The waves were gentle and the ocean somewhat glassy. The sun was out and it felt almost balmy at 56 degrees. I even had to remove one of my layers. You can see the dark clouds on the horizon slowly heading our way. The forecast calls for several days of rain and comes complete with high wind warning. 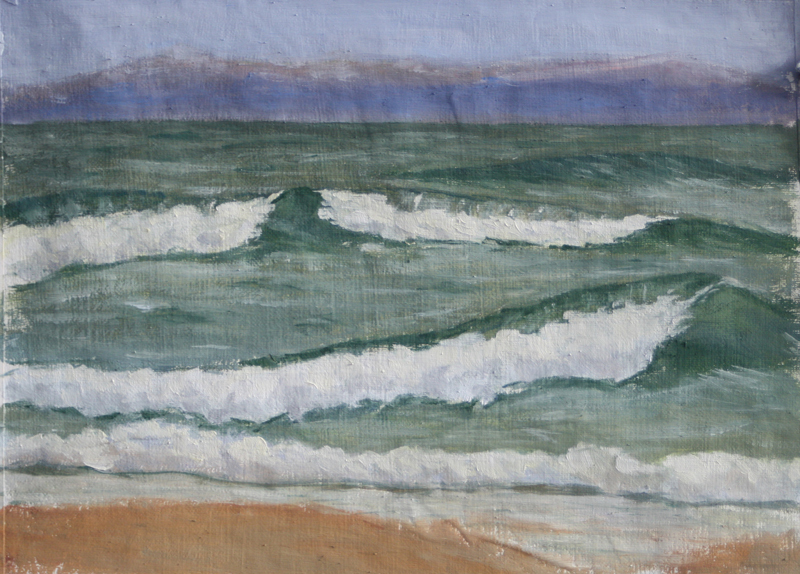 I took my time studying the waves today before starting to paint. One of the interesting features of this area is under certain conditions such as tides, size, and turbulence, the waves hit the toe of Neahkahnie Mountain, bounce off and travel sideways. When the surf is rough, the collision of the sideways traveling waves and the incoming waves is spectacular. It was high tide when I went down to paint but very calm so the waves were gently angling at times. I tried to capture that but the waves I painted just look like I wandered off track. I will have to work on that. Today's painting serves to show me how far I need to go still! It was a wonderful morning though. I stayed longer than usual and poked around a bit. I saw a group of 4 or 5 seals feeding just beyond the breakers. There was a dead salmon on the beach and the bald eagle that lives around here swooped down to feed. The seagulls were not happy to have their lunch disturbed. The eagle is easily twice their size so they didn't do much more than just annoy it. 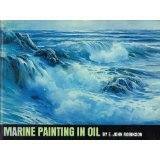 Not a good quality picture but the book is called Marine Painting in Oil by E. John Robinson. I got it used a while ago as it is out of print. I didn't pay much for it but when I checked on Amazon I noticed the price had gone up. I like this book. I was published in 1973 so the color quality looks garish to my digitally spoiled eyes. However, it does contain some of the best information I have found yet on painting waves. I was curious so I googled the author. He is still around and now sells DVD's of his lessons. I am content with my book but it is nice to know he is still around. I admire his paintings for the structure he conveys in his ocean and waves. I am not too sure about the color key he uses but that is a matter of personal preference. I am very grateful that he is passing on his knowledge and expertise. His website can be found at http://www.ejohnrobinson.com/. I am planning to go out everyday this week. I may have to get creative with the weather we have coming in though. My goal is to paint 100 small studies for starters. 75 of those studies will be on the loose hemp canvas I have been using. Since people have been asking, the last 25 I will paint on a museum quality linen board and I might put them up for sale. I do plan to make studio paintings based on the plein air studies on the same linen board and those will definitely be for sale. I plan to announce my ultimate goal here on the blog on New Years day, which is startlingly close! As always, the waves..lovely. The weather has started here this morning so I'm sure you are feeling it up your way. All wind right now. Makes the trees whispering carry all that much further.